Intel and the U.S. Department of Energy (DOE) have set plans to develop and deliver the first exascale supercomputer in the United States. The system, called Aurora, will provide an exaFLOP of performance or a quintillion floating point computations per second. Targeted for delivery in 2021, the system is being developed at DOE’s Argonne National Laboratory. The system is also being developed by Intel and sub-contractor Cray. The contract is valued at more than $500 million. The system will be used for both traditional high-performance computing and artificial intelligence applications. It will be used for cosmological simulations, medical discoveries, and developing new materials. Aurora will incorporate several chips from Intel, such as a future Xeon processor, Optane memory (3D XPoint) and the Xe compute architecture. 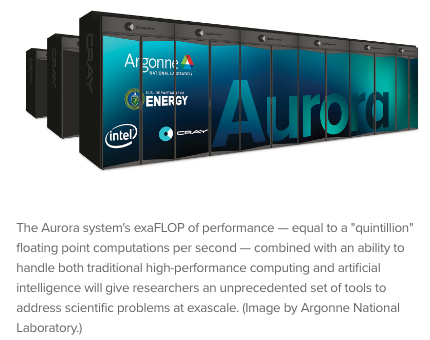 In addition, Aurora will use Cray’s next-generation supercomputer system, code-named Shasta. This consists of more than 200 cabinets. It also includes Cray’s Slingshot scalable interconnect technology. “Argonne’s Aurora system is built for next-generation artificial intelligence and will accelerate scientific discovery by combining high-performance computing and artificial intelligence to address real world problems, such as improving extreme weather forecasting, accelerating medical treatments, mapping the human brain, developing new materials and further understanding the universe–and that is just the beginning,” said Argonne National Laboratory Director Paul Kearns. Using simulations with a supercomputer, Technische Universität Berlin (TU Berlin) has developed a prediction model that controls noise. The model could help simplify the process of designing noise cancelling headphones and other products for use in airplanes, ships and ventilation systems. Noise-cancelling headphones are popular items. They analyze the background frequencies in noisy environments. Then, they generate anti-noise sound waves, according to TU Berlin. Another noise-cancellation technology is called a Helmholtz cavity or resonator. These are used in systems like mufflers in cars to control noise. The technology involves a cavity, which is connected to a system via narrow tubes. In operation, sound is reflected back. Helmholtz cavities cancel noise, but the technology is costly and time-consuming to develop. In response, TU Berlin devised a new analytical model, which can make Helmholtz cavities less expensive and efficient. The model was developed at the High-Performance Computing Center Stuttgart (HLRS). Using HLRS’s Hazel Hen supercomputer, the model can predict the operation of a Helmholtz cavity. The Hazel Hen is a Cray XC40 system, which has a peak performance of 7.42 petaflops.